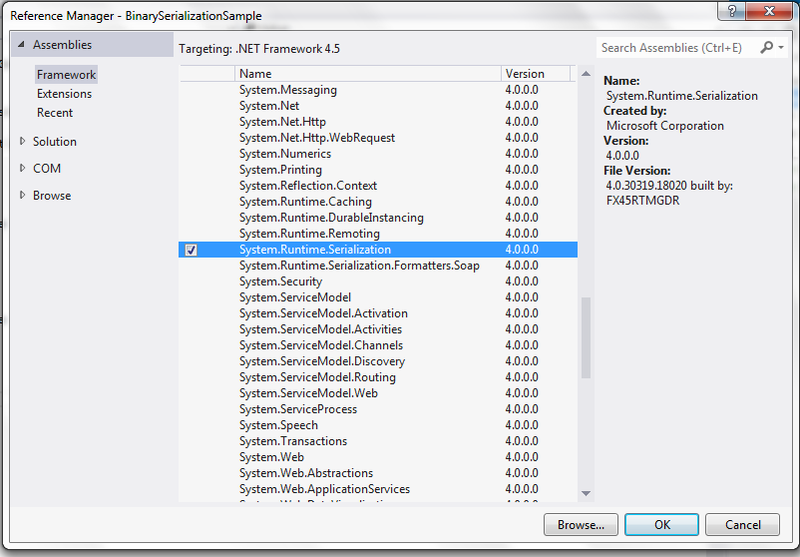 In the previous post, we discussed binary serialization with C# and .NET. In this short article we are going to dive into some specific examples of use of the SoapFormatter class to SOAP serialize objects to XML and deserialize from XML back into objects. 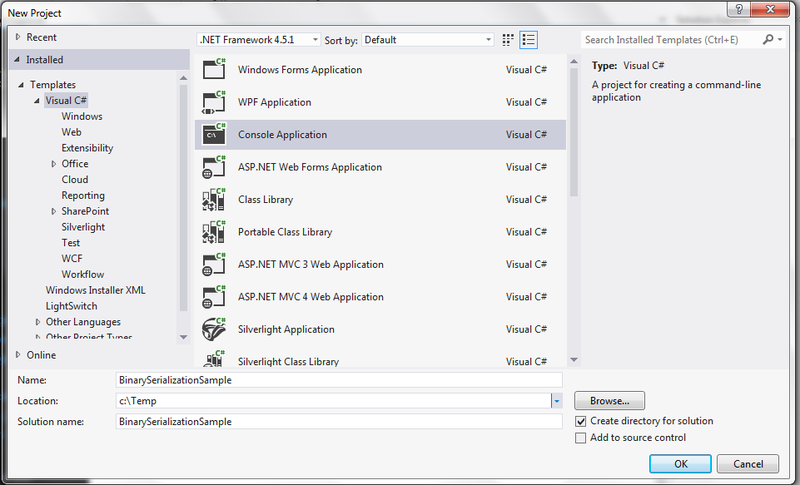 To get started, let’s create a C# Console Application that we will call SoapSerializationSample. As you can see, this class is very simple and is a great starting point for examining SOAP serialization. 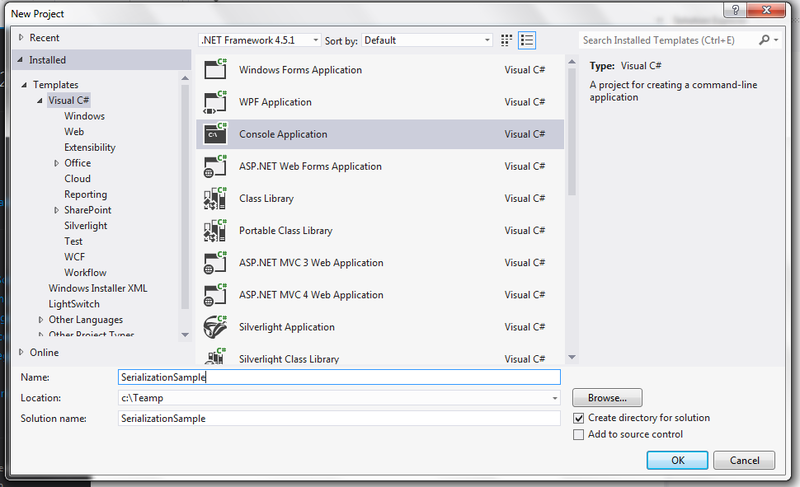 The Serializable attribute signals the .NET runtime that instances of this class can be serialized. To use serialization, this attribute must be in place at the class level. In our Program.cs class’s Main() method, we are going to write some simple code that uses the SoapFormatter to serialize an instance of our Sample object into a Soap XML stream. So, some of you are probably looking at this output and screaming “this is NOT well-formed XML!” and you are right! This file does not contain an xml declaration does not contain opening and closing xml tags. Though an in-depth discussion of SOAP is well beyond the purpose and scope of this article, it will be beneficial to briefly discuss the parts of a SOAP message. Soap is an acronym for Simple Object Access Protocol. It is basically an XML-based protocol for transmitting data between computers and is designed for for data communication via the internet and provides the transport mechanism for web services. SOAP is language and platform independent. SOAP messages are encoded as XML documents. These documents begin with a mandatory <Envelope> element and may or may not contain a <Header> element. The <Body> element is mandatory for all SOAP messages, so we would expect to always see that. A <Fault> element may or may not be contained within the <Body> element and is used to provide information about exceptions or errors that may have occurred while the message was processed. The <Envelope> element is the start and end of the message. The entire SOAP message is contained within the <Envelope> element. Every <Envelope> element must contain exactly one <Body> element – no exceptions! The <Envelope> will change if the version of the message changes. <Header> elements are optional within the <Envelope> element and there can be multiple <Header> elements in a SOAP message. The <Body> element contains the actual data being transmitted in the SOAP message. You can think of it as the “guts” of the message or the payload of the message. If you have ever worked with WCF, you are familiar with the FaultExceptions. When an error occurs during processing by a web service, information pertaining to that error can be encapsulated within a <Fault> block. If a <Fault> element is included in a SOAP message, there can only be one. If you are interested in learning more about the SOAP standard, try this link. This entry was posted in .NET Development, Serialization and tagged C#, C# Serialization, C# SOAP Serialization, SOAP, SOAP Serialization. 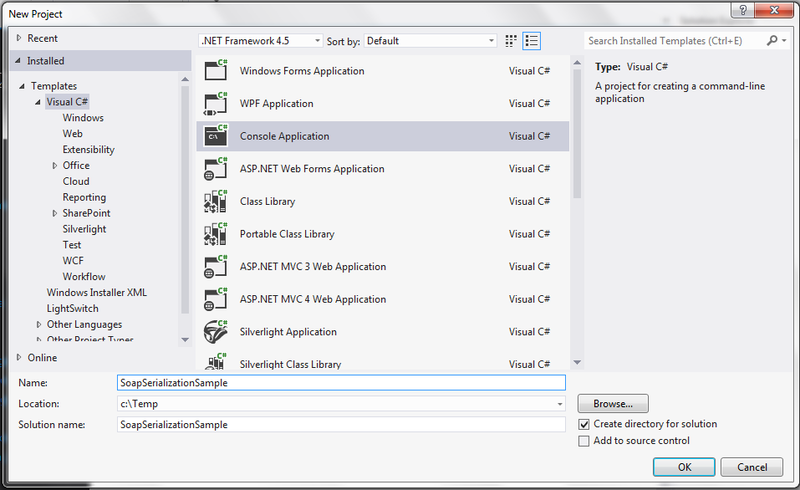 To get started, let’s create a C# Console Application that we will call SerializationSample. Let’s now add two properties – Name and Value as shown below. As you can see, this class is very simple and is a great starting point for examining Xml serialization. In our Program.cs class’s Main() method, we are going to write some simple code that uses the XmlSerializer to serialize an instance of our Sample object into an XML stream. When we press F5 and run the console application, our console window displays the resulting XML. See the following illustration. So when we look at the resulting XML, we see the standard xml declaration followed by the opening tag for our Sample object, an XML namespace (xmlns) attribute, and the values of the two properties in our object. Pretty simple, right? Though my intent in this article is to discuss XML serialization and not XML and its accompanying concepts, we do need to briefly talk about the concept of XML namespaces. XML namespaces provide a couple of things in our generated XML. First, they remove any ambiguity between two or more elements that happen to have the same name. Second, they are useful for grouping elements that relate and adhere to a common “idea” together. A namespace is identified and conveyed via a uri. So what does that mean? Well, I could define a namespace that I could use for all of my XML “objects” based on http://johnlnelson.com. I could for the sake of this example specify the namespace to be https://johnlnelson.com/namespaces/sample. It is a safe assumption that anyone who produces XML for the purpose of transmitting it via HTTP would do this via a domain, such as johnlnelson.com. Armed with this little bit of knowledge, let’s modify our code to specify our own namespace and prefix. Pay attention to lines 14-15 and the new overload of the Serialize() method in line 19. We created an instance of an XmlSerializerNamespaces object and added one prefix/namespace combination. The prefix I chose is “jln” and my namespace is https://johnlnelson.com/namespaces/sample. When we press F5 to launch the application and view our XML output, we see our own namespace in the XML. Pretty simple? Sure it is. Now let’s take a look at the encoding attribute in our xml document tag. What if we don’t want to use the default IBM437 encoding? We can do that too, but the code is slightly more involved (but not too bad). Okay, so what’s going on here? First, in order to take the level of control over our encoding, we had to initiate the help of a StringWriter and an XmlWriter. 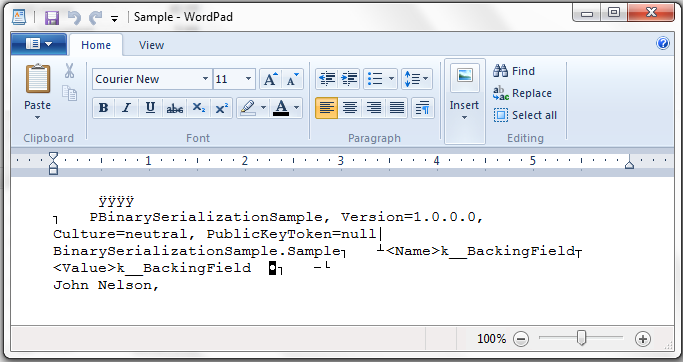 We created an XmlWriterSettings object to allow us to specify the encoding and the indentation for our XML output. Then we wrapped the XmlWriter in a StringWriter which we then used to send our output to the Console window. We won’t go into too much detail about StringWriters and XmlWriters in this article, but let’s just take from this the fact that it is possible to exert varying levels of control over our XML serialization. Before we jump into deserialization, let’s hop back to our Sample class and take a look at some ways we can control how instances of this type are XML serialized. This sample class has two properties: Name and Value. As it stands now, both properties get serialized when we call the XmlSerializer.Serialize() method. Let’s look at some ways we can control this. By adding this simple attribute, the XmlSerializer will not serialize this property. Let’s press F5 and give it a try. When we place a breakpoint and view the XML output in the XML view window, we notice that the Value property did NOT get serialized. What if we want to serialize a property, but we want the XmlElement to have a name other than the actual name in the object? This is equally simple by decorating that property with an XmlElement attribute. See the code below. As we can see in the output, the Value field is serialized as TheValue. Pretty simple. There are more customization options available through attributes, but we are not going to cover all of them here. This MSDN resource is an excellent source of information. Now that we have discussed XML serialization, let’s look quickly at how to deserialize our XML and re-inflate a Sample object. The commentary in the code is pretty straightforward. We serialized our object into a StringWriter then got that object’s underlying StringBuilder and got its string representation via the xml string object. Then we created a StringReader to utilize the XML string value as an input to our XmlSerializer.Deserialize() method. We immediately cast the return object to the Sample type because we knew that it would work. In most situations like this, should NOT attempt such a cast. Instead, you should stuff the result into an object, then check for null BEFORE attempting the cast. That is just a good programming practice. In the next article, we will take a quick look at binary serialization. 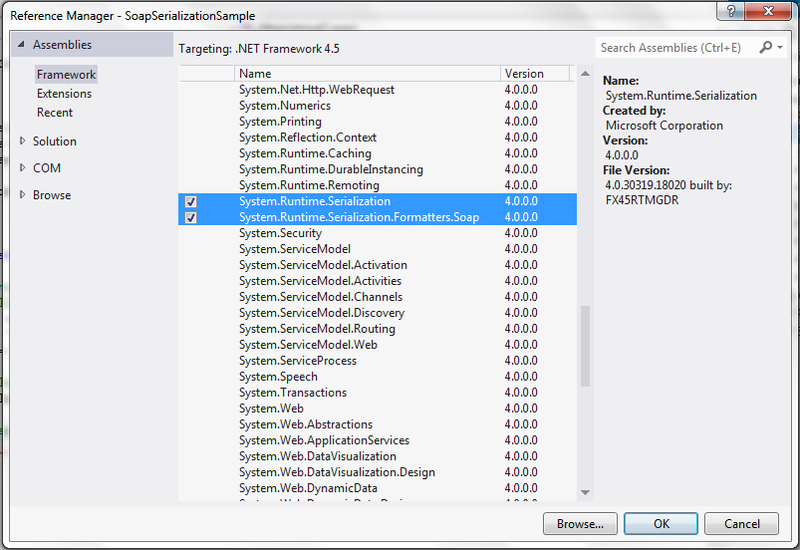 This entry was posted in .NET Development, Serialization and tagged .NET, C#, C# Serialization, C# Xml Serialization, Deserialize, Serialize, XML namespace, XML Namespaces, XML Serialization .NET, XML Serialization C#, XmlSerializer, XmlSerializerNamespaces.